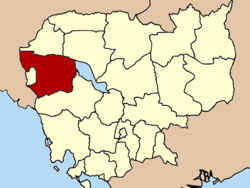 small rural village in Bat Tam Bang province in north-western Cambodia. Life in this part of Cambodia is hard, with most of the population surviving on subsistence agriculture. Mon carries the responsibility of raising her small daughter on her own. With only a 6th grade education, she found an opportunity for stability when she was accepted into a weavers’ cooperative in 2006. 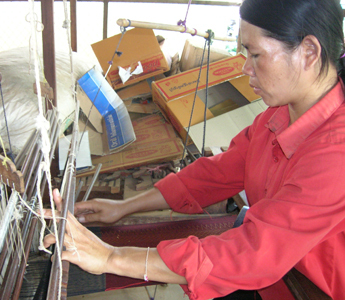 In this co-op Mon received intensive training in the traditional skill of loom weaving. 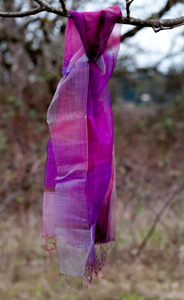 She now has regular work with her co-op to weave beautiful silk and cotton textiles. 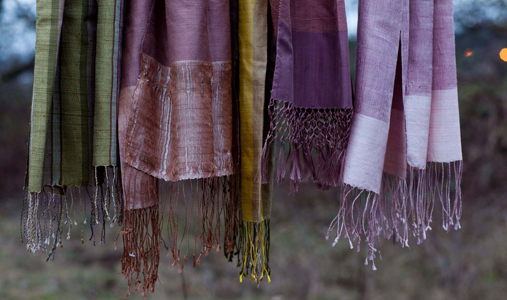 The textiles Mon and her fellow weavers make are used in the production of a number of items, including Bambootique’s newest line of natural-dye scarves. These are our highest-quality, softest scarves we’ve ever carried. 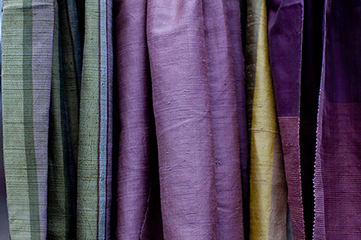 The silk is hand-dyed with 100% natural dyes made from local plants so there are no chemicals used. They’re so silky soft and lightweight, perfect for spring. See a sneak preview below and the full collection here. Ben and Jerry’s recently took a bold step in declaring their switch to be fully fair trade by the end of 2013. They’ve long used fair trade coffee chocolate in some of their yummy flavors (think Smooth Chocolate and Coffee Heath Bar Crunch) but now they’ve set their own bar even higher. Over the next few years the company will source all ingredients available Fair Trade Certified to be just that. They’ll be using fair trade bananas, sugar, cocoa, coffee, vanilla, nuts and other flavorings, adding new fair trade ingredients as the fair trade marketplace grows and new products become available. Wow! I have not heard of any other ice cream company making such a move. Ben and Jerry’s switch will influence over 27,000 farmers, according to a press release on their site. Impressive. Whisk together the cream, cocoa powder, sugar and salt in a large saucepan over medium-high heat. Whisk frequently until it begins to foam and boil. Remove from the heat and add the chocolate chips, stirring constantly. You want the chocolate chips to melt most of the way but still leave some small chunks at the bottom of the pan. Once the chocolate is mostly melted (no big chunks coming up when you stir) add the remaining milk and vanilla. 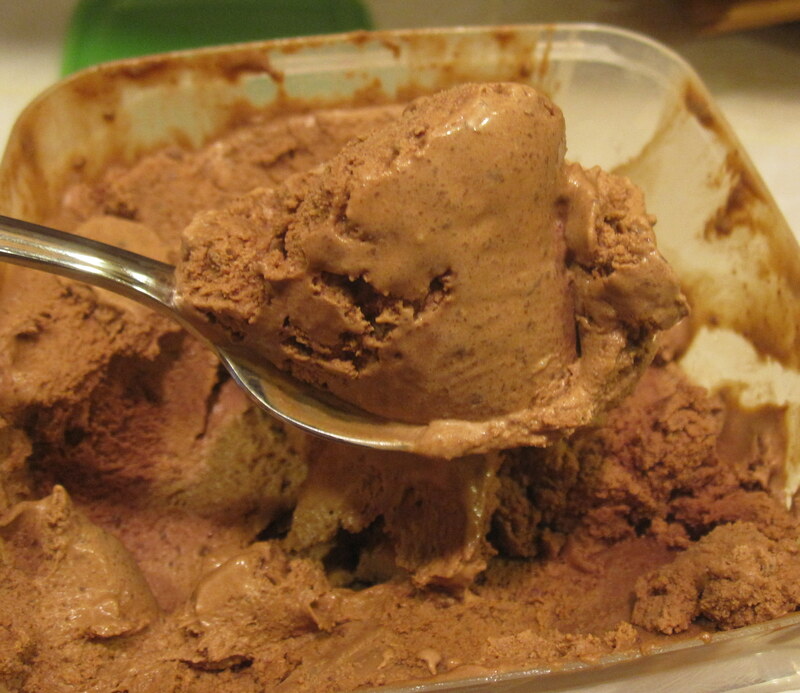 Chill in the fridge until cold all the way through (at least 2-3 hours), then freeze in your ice cream maker according to manufacturer’s instructions. Then enjoy a divine chocolate experience! By the way, Sunspire chocolate chips are super expensive compared to regular old Nestle. Most grocery stores around here that carry them (Whole Foods, New Seasons) charge anywhere from $5.50-$6 per bag. That makes for a pretty expensive quart of ice cream or batch of chocolate-chip cookies, unless you do what I do. 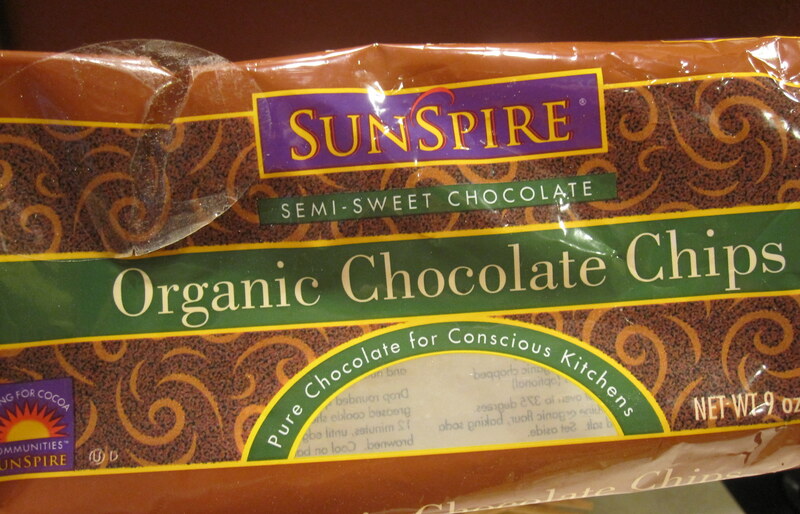 Sunspire has lately had a $3 off $10 on every bag of chocolate chips. I wait until they go on sale, usually for around $4.50/ bag, then stock up buying 6 or so bags at a time. With the coupon that makes them about $3.50 per bag. Still more than a cheap brand of chocolate chips but much closer, plus the Sunspire flavor does not compare to Nestle (which tastes like it contains more wax than chocolate). Yes, spring is officially here. OK, maybe not by the calendar but judging by how beautifully sunny it is outside today and the daffodils springing up in my front yard, I am declaring it spring in Portland. Regardless of the weather or season wherever you are, the first of Bambootique’s spring lines are now here and available for both retail and wholesale customers. We have beautiful new styles of recycled pewter jewelry from Honduras (made from soda cans) and a fun and flirty new style of bamboo clutch purse from Thailand. 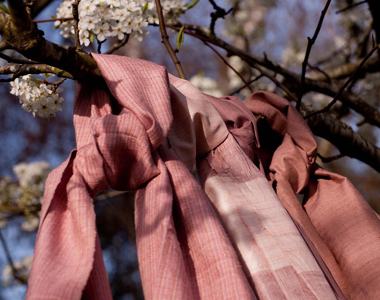 Stay tuned for gorgeous new spring scarves from Cambodia coming in about a month too. Changing distribution strategy like this is nothing new. The UN World Food Program has used such an approach in other disaster zones to great success. When women are given food they are far more likely to wait their turn calmly and to make sure it gets to their children, elderly parents, as well as to the men in their household. So the men aren’t actually left out, they just have to be nice to their wives to get fed. Speaking of husbands and wives, my own dear husband, Steve, will be leaving soon for Haiti. He’ll be working with two fabulous organizations, Medical Teams International and Haiti Foundation of Hope. He’ll work a week in mobile health clinics in Port-au-Prince followed by a week in HFH’s community health program in northern Haiti. This is his fourth trip to work with HFH’s community health program, a program that empowers community members (men and women alike) to be agents of health change in their own communities. The Haitians he’ll be working with are true change agents, the real future of a brighter Haiti. I appreciate your prayers for him and for the rebuilding of Haiti. I just had to post this blog link from a Mennonite Central Committee missionary in Haiti. His account of experiencing the moments immediately following the earthquake, before any one here even knew what had happened, are awe-inspiring. 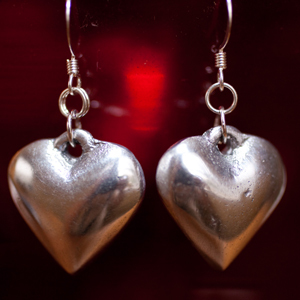 Check out our brand new Have A Heart earrings, just in from our jewelry cooperative in Honduras. 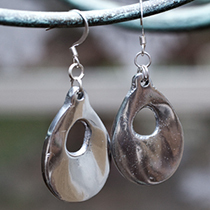 The earrings are part of our collection of pewter jewelry, with the pewter being made from recycled soda cans collected and processed by Lencan (indigenous) artisans. 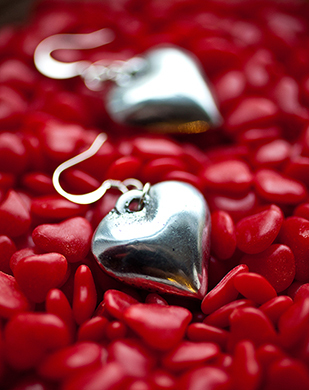 These earrings are just $19/ pair and are in a very limited supply, so grab them soon if you want to give them for Valentine’s Day. They are of course fair trade and, being from recycled materials, are eco-friendly to boot. I have wept each day since the earthquake hit Haiti last week. I find myself compulsively drawn to CNN’s news coverage but then so burdened by the despair, the death, the horror. Especially hard for this pregnant mom are the images and interviews of moms and children. Yesterday MSNBC’s medical correspondent interviewed the mom of a 5-year old with a broken leg. The mom had just found out her daughter’s leg was infected due to lack of antibiotics and would have to be amputated. In front of her small child she told the interviewer she’d rather her daughter die than be an amputee. The fear and despair in that child’s face when she heard her mother utter those words tore me to the core. But in a tragedy with a death toll possibly topping 200,000, THERE IS HOPE. This hope is all I, and even more so every single Haitian now in mourning, have to cling to. There are the news stories of dramatic rescues of the living still taking place, a full week after the quake. There are the stories from our dear friends, Dr. Joe and Linda Markee, now serving on the ground in one of Port au Prince’s few remaining hospitals. There is the outpouring of generosity from foreign nations, including ours, and the promises to make sure that aid continues beyond the immediate to help Haiti rebuild. There is the above picture, of the Terre Blanche clinic about 120 miles north of Port au Prince. It is still standing and is expecting the arrival of the wounded from Port au Prince seeking medical care. Haiti is a largely Christian nation and the images of the newly homeless singing hymns together in the face of the destruction is a testament to the hope the Haitian people still somehow have. Like so many Haitians, my hope and comfort comes from Jesus Christ. The horrific images I see on TV make no sense to me but I believe in the words of Jesus in John 11:4 when he says “…this is for God’s glory, so that the Son of God may be glorified through it.” May small stories of hope encourage and lift your spirit as well in the face of so much sadness. For more on how you can help in Haiti visit Haiti Foundation of Hope. I am utterly dismayed by the news of the 7.0 earthquake to strike Haiti’s capital, Port-au-Prince, last night. In a country where 85% of the population already lives in poverty, infrastructure is almost non-existent, and the government is perpetually unstable, this earthquake’s effects will reach farther than we are even yet imagining. Information out of Haiti has been slow-coming and, when the dust settles and TV crews can get footage out, I believe we will discover a major city of 2 million, just a short flight from Florida’s coast, has been totally destroyed. I spent just a short week in Haiti in 2004 as part of a disaster assessment following Hurricane Jeanne. While I have not returned my husband, Steve (MD, MPH), has since traveled multiple times to Haiti to participate in the community health work of Haiti Foundation of Hope. HFH works in an area north of Port-au-Prince that, as far as we know, has not been heavily damaged by the earthquake. However the founders of HFH, Dr. Joe and Linda Markee, are leaving later this week for Port-au-Prince in cooperation with Medical Teams International to see how the two organizations can help at the heart of the disaster. If you are looking for a way you can help, I strongly urge you to GIVE GENEROUSLY to Haiti Foundation of Hope. With Dr. Joe and Linda on the ground right away they will be able to assess the best way to use the funds given to meet immediate needs of those affected by this disaster. Please also PRAY. HFH still has not heard from its in-country contacts, Pastor Delamy Bazilme and his wife Elvi. They live in Port-au-Prince so naturally we are all concerned. Assuming they are healthy and well, the first place they will be is out helping their neighbors and so prayer for their continued safety is essential. As a nation Haiti was already so desperately in need of miracles. That need is only now exacerbated. Bambootique is thrilled to announce that Portland’s Ten Thousand Villages store just added our products to the store’s great array of fair trade products! Ten Thousand Villages gorgeous store is located in the Pearl district at 938 NW Everett Street. They have an incredible selection of high-quality, high-end fair trade goods like housewares, rugs, furniture and of course personal accessories like Bambootique’s. If you’re in Portland and doing some last minute Christmas shopping this weekend, make Ten Thousand Villages your shopping destination! My friends over at World Pulse magazine just let me know of a great offer they’re running for the holidays. Buy a membership to their fabulous organization for yourself, get a free membership to give to a friend! Membership is $30 and includes a subscription to their paper magazine as well as access to all their great online information and inspiring stories of women worldwide. World Pulse is giving voice to so many women who would otherwise go unheard by the media. Join the conversation and get a friend involved too! 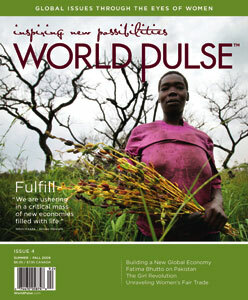 I’ve given World Pulse as gifts myself and every woman I’ve given it to has been so grateful to know such a publication exists. More information on this holiday offer here.